October 2019: First lesson Saturday 5th October for 4 weeks. November 2019: First lesson Saturday 2nd November for 4 weeks. December 2019: First lesson Saturday 7th December for 4 weeks. January 2020: First lesson 4th January for 4 weeks. February 2020: First lesson 1st February for 4 weeks. March 2020: First lesson 7th March for 4 weeks. The next Learn to Row course will start on Saturday 5th October 2019 at 8:30 am. If you would like to register then follow the process for registration below. 1. Read this page fully to understand all of the options available to you. 2. Download the Application for Learn to Row form from the link on the right. 3. Download a copy of the LTR Student Manual, (lower down the page) and read it fully to understand what is involved. Confirm you have ticked the month for the lessons you would like to register. 4c. Turn up on the relevant Saturday for the first session around 8:15 for the initial registration process. All other sessions will start at 8:30 am on the following Saturday mornings. We usually finish each lesson from 10:30 to 11:00. Application for Learn to Row form can be downloaded here. You will need to print this out and have paid the fees ($210) before you come down for the first lesson. The first lesson is at the shed. It starts at around 8:30 am and usually ends between 10:30 to 11:00, depending on class sizes. All of the lessons on the following weeks are within the same time timeframes. The first lesson is structured into 4 blocks. These cover water safety and government regulations, how to use an ergo, oar types, boat construction and naming conventions, and putting a boat on and off the water. At the end of Session One, we get all of the class to get a suitable boat out of the shed (depending on the number of students) We address all of the major components in the boat, and then the group takes the boat to the river, rig the oars and everybody gets into the boat. Usually, a couple of City Cats provide some waves to make this interesting. After this activity, everybody then takes the boat back to the shed, washes everything, and put all of the equipment away for that session. Sessions 2, 3 and 4 are covered in the LTR Student Manual. They consist of full-time rowing on the river for an hour to 2 hours each session. Following each session is an optional coffee at a local coffee shop. This is so that all of the learnings can be consolidated with the rest of the class in a safe and social environment. Some bragging may be encouraged at the coffee shop, for those who feel the need. In October 2014 we introduced a new structured approach to the rowing classes. Each month there will be 4 lessons on a Saturday morning at 8:30 am, with basic LTR on lesson 1, and progressing to Advanced LTR by Lesson 4. The idea is to keep a class together so that all members of the class progress at the same rate. If you miss out on starting on the first week of the month, then you will be able to start the programme on the first Saturday of the next month. New students enrolments will only be accepted on the first Saturday of each month. This way the students will have a much better chance of developing skills which are incremental, and train with a consistent group of people in that class. At the end of the 4 lessons, all students will be offered advanced Learn to Row lessons in the Transition Squad for an extra 2 months after they have finished the LTR lessons. The Transition Lessons are held at a time that suits the graduates from that month’s intake. The club will provide a dedicated coach for advanced lessons, focusing on endurance and continuous rowing. Once the students have completed the transition lessons, they will be “graduated” to a recreational rowing programme and be eligible to become full-time members of the club. We believe that this will provide a much better quality of training for students, and help develop a better level of confidence to become full-time recreational rowers, with the opportunity to enter the competitive stream if they desire. Any queries that you still have after reading the information on this page can be sent to the LTR Coordinator to be answered as quickly as possible. The GPS LTR Student Manual can be downloaded here. It is recommended that you print this before the first lesson, and bring your copy to make notes in etc as the lessons progress. What is covered in the Learn to Row Programme? The Learn to Programme (LTR) is structured into 6 specific areas of focus. Initially, the new member will be shown around the shed, and given a briefing on boat handling, shed etiquette, location and storage of equipment, and safety on and off the river. During the winter months, safety is very important, due to boating activities in the dark. Next comes familiarisation with boat configurations, setting up boats to suit individuals, and oar selection. 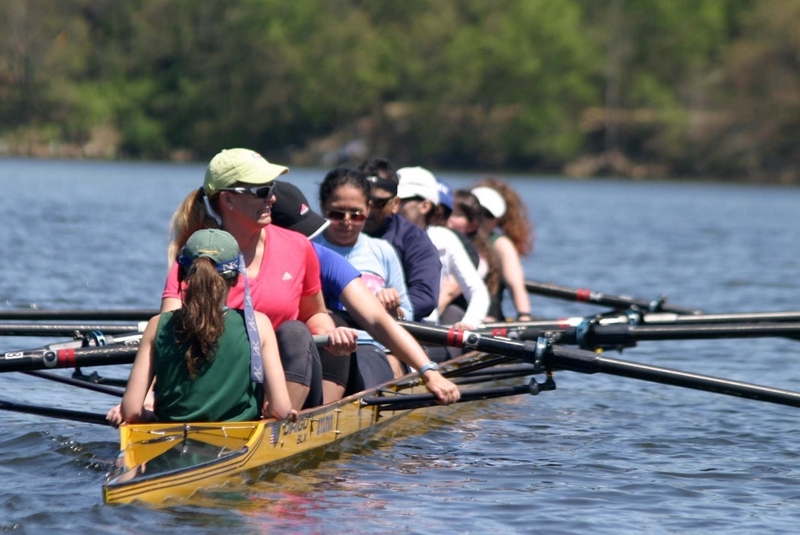 On water lessons then cover the basics of sweep and scull rowing configurations, the 4 phases of the rowing cycle, and how to row as a team member. At these initial sessions, safe operating procedures are highlighted, in relation to operating a boat on the river, and awareness of other river traffic, particularly City Cats. Later lessons then focus on technique improvement, developing automatic responses to balance and timing, and preparing for graduation. At the end of the 4 lessons, most members are sufficiently skilled that they are then able to use the club equipment during the morning training sessions, recognising that continual improvement only comes with effort and coaching support. Extra advanced lessons are offered for 2 months once the 4 Saturday mornings have been completed at a time that suits the group. The intention is to offer skill correction while the squad completes some long distance (5km to 7km) rowing in the advanced lessons. 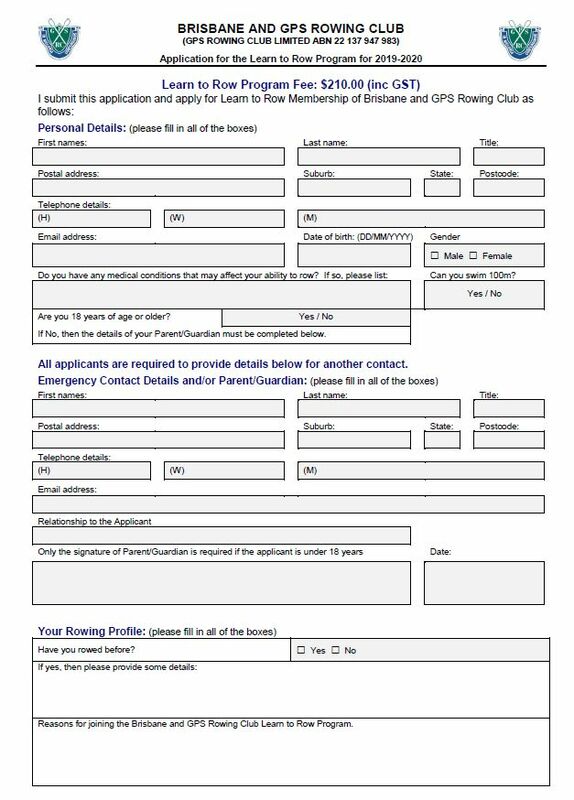 To save time on your first Saturday morning, It is suggested that you download the Learn to Row Application Form from here, and complete it. You will need to pay in advance by direct credit to our account. The details are on the Membership page and in the LTR Application form. Do NOT bring cash to the shed. We are unable to receipt and process in this location. It is recommended that you come prepared for some physical exertion, on the water. In the summer months it can get quite warm, so a hat and water bottle are very important. Generally, bike pants or close fitting shorts will give the rower confidence in the boat, and make sure the clothes do not get caught on oars, seat slides etc. A firm or close fitting shirt is also recommended. Loose clothing can be dangerous if it gets caught on the equipment. Thick socks or firm slip-on rubber soled “reef walker” type shoes help, but it is possible to row in bare feet initially. NOTE: Sunscreen is also very important as you will outside for at least 2 hours (before rowing, on the water, and afterwards cleaning etc). The lessons will not be highly physical, but some degree of fitness (e.g. able to walk for 30 minutes with no effort) will make the on water sessions more enjoyable. By the fourth lesson, you will be able to row continuously for at least 20 to 30 minutes, which can be tiresome if you are not reasonably fit. Generally, the answer to this is yes. If a person is a complete beginner or has not rowed for many years, then the Learn to Row (LTR) programme is the ideal solution to getting a new member skilled enough to be able to take a boat out unsupervised at a time convenient to them. The LTR sessions are held every Saturday morning at 8:30 am and cost $210.00 for the 4 lessons. This includes a $15 registration fee with Rowing Queensland to cover insurance and other fees. The new member is required to attend 4 sessions starting on the first Saturday of each month. Generally, there are people at different levels of the LTR programme attending on any given Saturday, and the new members are mixed together to provide a cross-section of skills in the LTR sessions. After the 4 basic lessons, advanced lessons are offered to reinforce the lessons learned in the basic lessons, and provide some level of endurance rowing skill. Once all of the lessons have been completed, the option is available to join the club as a full-time member. This is very popular and provides a launching point to continue their rowing activities. In some cases where people are transferring from another club, the management likes to see the new member at a Saturday morning session just to make sure we all have the same understanding of the skill attained by the new member. This helps to make sure that the new member is able to be connected with current club members of similar skill levels. Do I have to be in a team, or can I be placed in a team by your club? Most teams are created as people of equivalent skill meet and train together. When nominations are called for regattas, the usual procedure is to have people who have been training as a team to nominate their team as a group. If you prefer, the club can provide a team of generally equivalent rowers, if you are not familiar with the names and skills of other club members. The following is an extract from the LTR Application Form. 1. Four Learn to Row sessions which need to be completed within three months from the date of this application. 2. Registration with Rowing Queensland which includes Insurance through Rowing Queensland. 3. 2 extra months in a transition squad, preparing for regular club membership. Once the LTR training is complete, then the club provides access to boats, etc within the annual fee. Some on water technique rectification have been provided in a fairly unstructured way in the past. If a member requires personal coaching, then this can be arranged for an extra fee to the standard membership fees. Generally, the members have to make a specific arrangement if extra services are required out of the scope of the basic services provided by the club. What is the rowing timetable after I Graduate? Training sessions are from 5:00 am every day of the year. Any fully paid up member is welcome to come as often as they like. A regatta timetable is available on the Website for specific racing events. Otherwise, it is up to the individual members to make their own arrangements on how often they train, with whom, and to what level they feel comfortable. There are really no other costs except if you choose to buy some of the Club’s gear T-Shirts, Hats, pants, tops etc. Again, details of these are on the website on the Merchandise page. When rowing it is suggested that you wear tight-fitting clothes, bike shorts, singlets etc as loose clothing can catch in the seats, oars and make things harder for you. Also, make sure you have a hat, sunscreen, and a water bottle to help make your sessions more comfortable and enjoyable.